Well. Err… Oooookaaaayyyy. Probably just as well I was keeping the expectations on the down-low then. Four games in. Two draws. Two defeats. Two points. Two penalty kicks being two-thirds of the goals we’ve thus far scored. Twentieth place in the table. Even keeping my excitement hemmed in, and with us being only 9.5% of the way through the season, is it greedy to suggest I’d have liked to have seen a little more by this point? Positives from the campaign thus far? Well, umm, the fresh-faced academy lads that have come in, Craig Robson and Harvey Whyte, have looked promising. Apart from that, well…, urrr…, oh yeah, we’ve got a new flag for behind the goal. The new banner celebrates our striker Mustafa Tiryaki’s Turkish background and heritage. I defy anyone to think of a better method to pay tribute to a hero, to gratefully offer a token of the high esteem in which they are held, than to deface their national flag. Mind you, he seemed pretty pleased when it was waved at him. 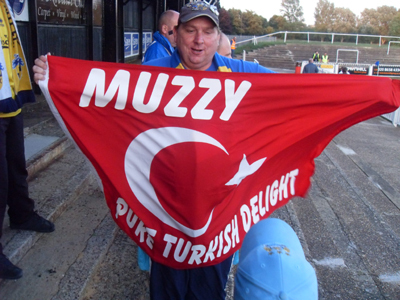 ‘Muzzy: Pure Turkish Delight’. So, at least we have confectionary based references on our bunting to keep us buoyant as we await our first win and, to be honest, tonight’s second half aside, performances have not been that dreadful as to suggest we’re going to have to wait too long a time for it. We just need to re-discover our confidence in front of goal. However this last 45 was very much like the dark days of last season, with the players taking the opposition’s first goal as an opportunity to give up more ghost than a retiring exorcist. A feature of our remarkable, ridiculous, scrumptious turnaround last season was a re-assertion of control across the midfield. Ian Selley’s signing was a big part of that and perhaps it is significant that he wasn’t in the side for this game. Indeed, it was his replacement Craig Robson’s loss of possession just outside the Bromley box that ultimately led to their winner. However this is to be too harsh on the lad who, as suggested earlier, put in a very tidy shift for one so young. Indeed, if blame for such a poor performance has to be pointed anywhere, there were many more deserving in our five-man midfield than Craig. Sammy Igoe still appears to be getting the measure of life outside the Football League and has yet to impose his qualities on Conference South opposition. I’m sure this will come, and hopefully soon. Wes Fogden is always capable of something special, and indeed our only goal not from the spot thus far was a typically presumptuous 25-yarder from our Wesley. However, in this game, he frequently went missing from play, to the point where we might have believed he had sunk into the turf, face up, with only the tip of his nose on show. Mind you, with his belting, brazen schnoz, that would still mean about ten foot of turf and soils would have to be shifted to pull him out and back into the game. Whilst some were wanting for effort, the evening’s most noticably poor performance belonged to Bobby Hopkinson who just couldn't get anything he tried to work out. His mistimed passing and tackling seemed to be that of a man with a contact lens missing from his bad eye, and a magnifying glass glued to his good one. When it came to attempted clearances, he was swinging and missing so often, his right leg was starting to resemble Ray Charles’ 3-wood. I would like to think there would be a reaction this when we go to bottom-of-the-table Dorchester on Saturday. Yet, of course, they will be looking to kick-start their season every bit as much as us. It’s going to be a battle, and we’ll need more gumption than was shown in the second half here, that much is clear.